Click on any image for full-size, which may also allow you to zoom via browser tools. 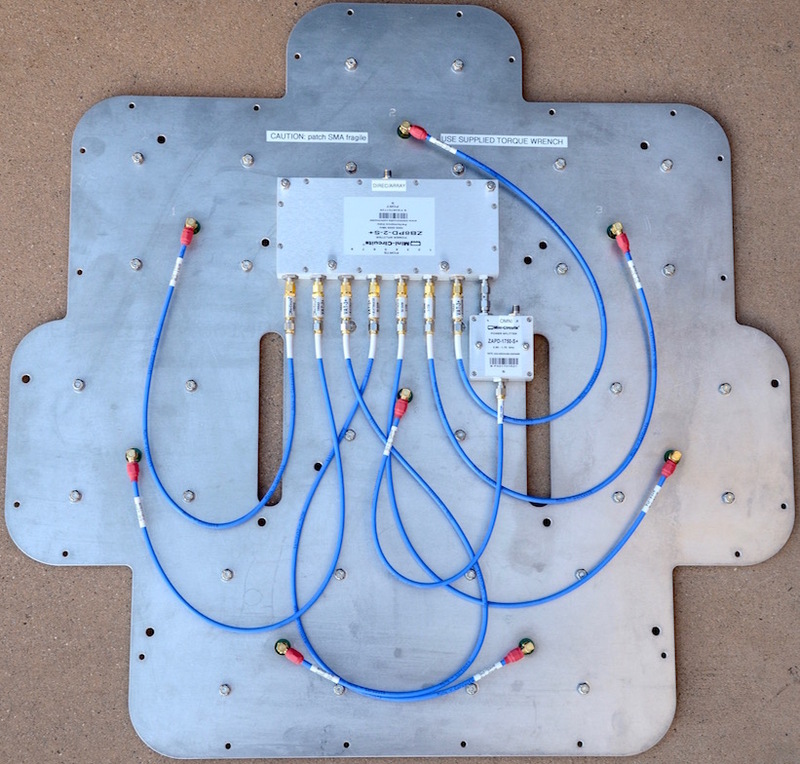 The TBAD antenna is a phased array of 8 (7 in older designs) patch antennas. Each patch is a relatively narrow-band antenna tuned to 1090 MHz. The metal mounting plate provides a continuous ground plane for all antennas, and the slots are present to help reduce wind-loading. A look at the back of the antenna helps understand TBAD's fundamental operating principle. Much of TBAD's robustness comes from attention to the ratio of signal from the entire array compared to that of a single patch. 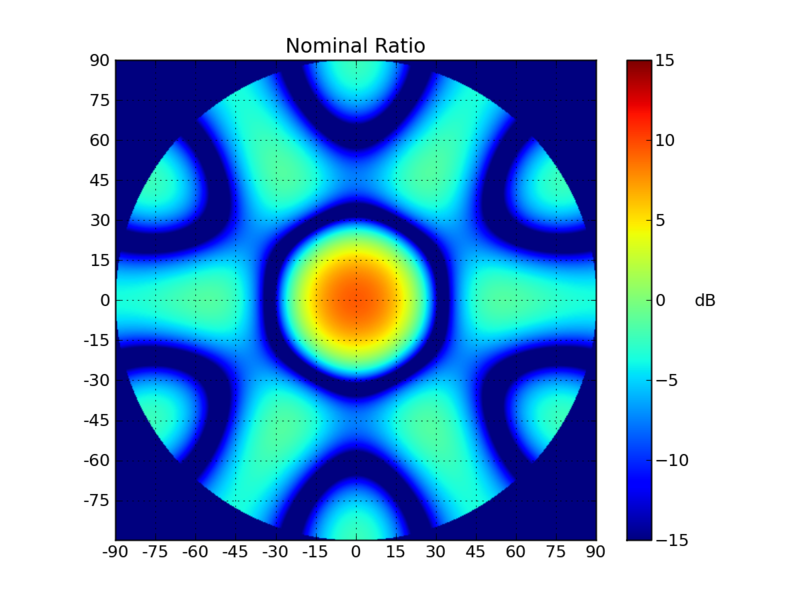 This ratio is sensitive to the angular position of the source relative to the antenna normal (boresight), but insensitive to source distance, power, or polarization. The central patch serves two roles: member of the antenna array, and single patch for the ratio comparison. Tracing the cable from the central patch, we see it hit a 2:1 (−3 dB) splitter. One output of the splitter is available as the single-patch reference, and the other feeds the 8:1 summer (splitter run backwards) together with all the other patches—each having a −3 dB attenuator to bring in line with the splitter output. Thus the output of the 8:1 summer is the phased combination of all patches forming a directionally concentrated beam response. 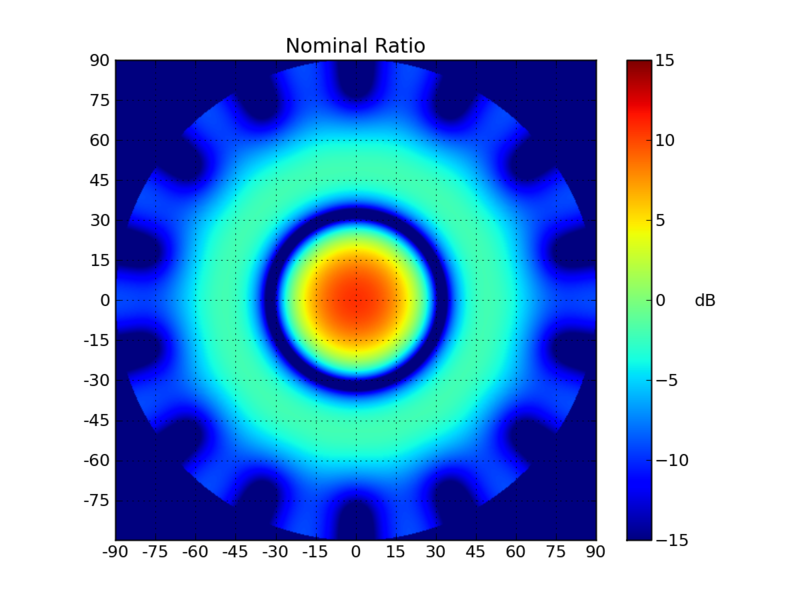 Now we look at the resulting ratio pattern. The ratio between array and single-patch signals as a function of angle in the sky is sharply peaked around the antenna normal. Setting a threshold at, say, 5 dB (ratio of 3.16) safely differentiates between transmissions within the central region and those elsewhere. The older 7-element array design (six-fold symmetry) had poorer azimuthal uniformity (seen here) but still isolated the central zone well. Below we see cuts through the pattern in a more traditional format. 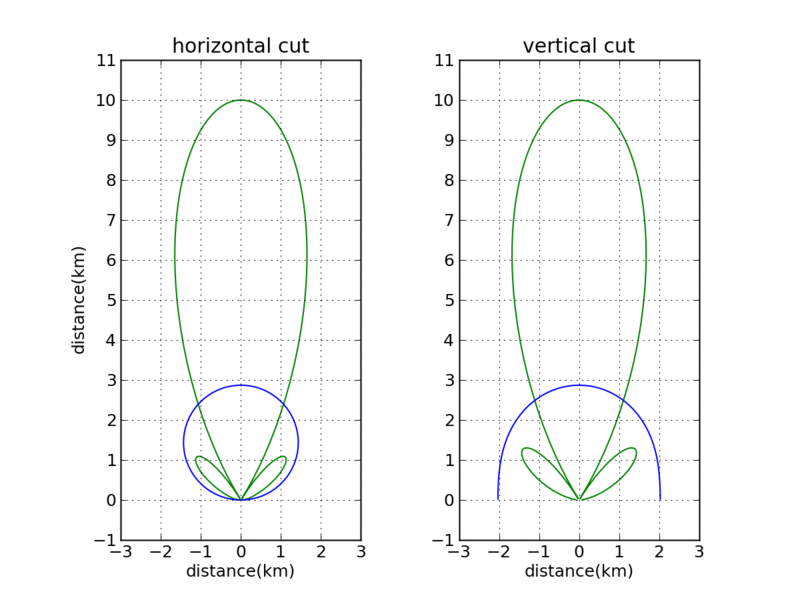 Expressed in terms of distance (normalized to 10 km, though TBAD can go to 200 km if needed), the beam patterns appear as shown here. The green curves correspond to the directional array, while the blue curve represents the single patch (often called "OMNI" in TBAD parlance, though not strictly omni-directional). Yes, there are sidelobes, but that's where the ratio comes in: only where the green curve exceeds the blue curve is the ratio greater than one. This is a measurement of the reflection coefficient for a single patch, showing the narrow-band nature of the antenna elements. Each division is 10 MHz horizontally, so the −10 dB points (corresponding to 10% reflection, or 90% transmission) span about 10 MHz and the −3 dB points (50% reflection) span 26 MHz. A narrow-band filter in the system additionally suppresses any transmissions more than 100 MHz from 1090 MHz by more than −70 dB. 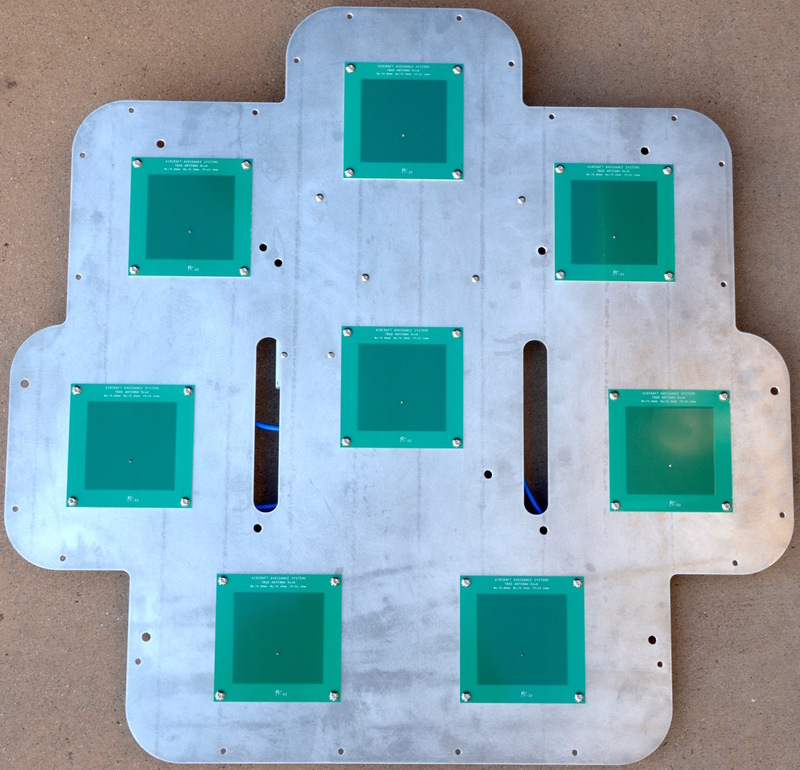 The discriminator unit sits close to the (passive) antenna, having inputs corresponding to the single patch and array combination. Its job is to decide if a signal is close to the antenna boresight. Numerous thresholds control sensitivities (beam threshold, distance sensitivity, saturation conditions, background requirements, and measures to reduce false triggers from multi-path interference). Front-panel connectors allow monitoring and diagnosis during characterization and/or troubleshooting activities. 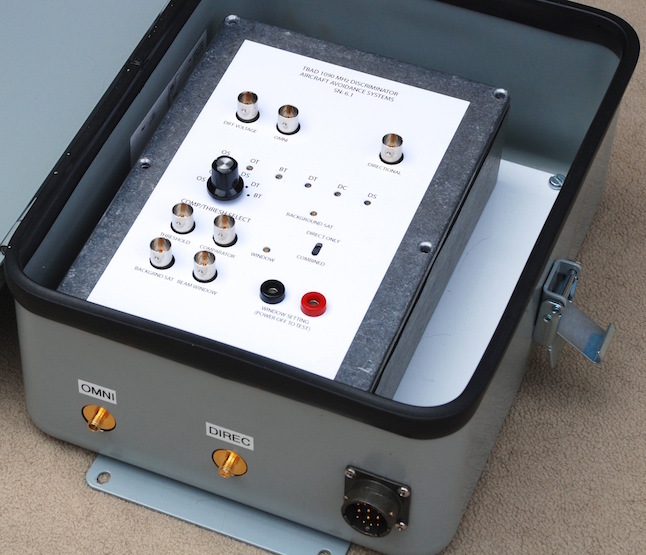 While the discriminator (above) needs to be close to the antenna and is in a weather-tight box, the decoder is a rack-mount unit that can be tens of meters away, connected by a single data+power cable. 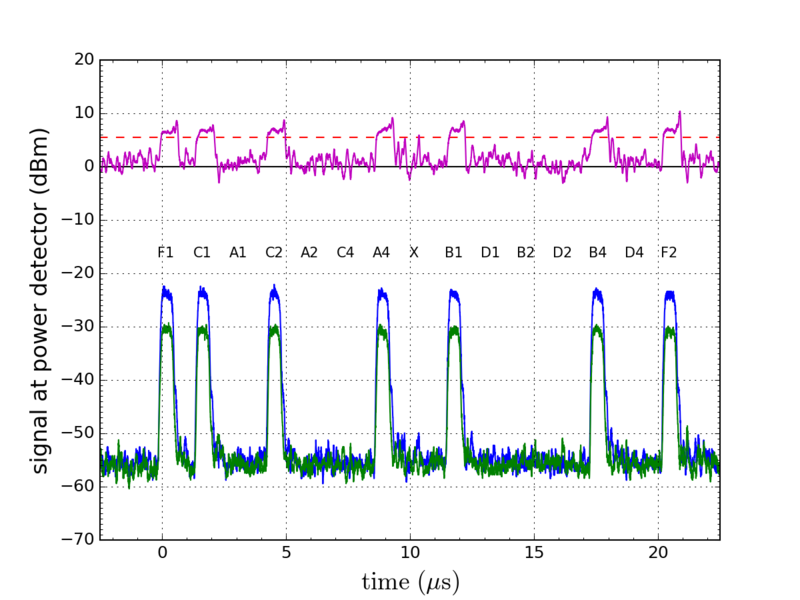 The decoder interprets the discriminator outputs (threshold-based information) and applies varying levels of decision-making about whether to close the laser shutter (via TTL-level output). The micro-controller provides a robust and low-level interface (no operating system). Serial data is exported for logging purposes, but TBAD relies on no external connection for performance of its protective services. LEDs and a speaker on the front panel provide indications of aircraft activity, and some system settings are also accessed here. TSIM generates RF signals mimicking transponder signals from aircraft, albeit at a very low power appropriate to direct connection to the discriminator or free-space transmission to the TBAD antenna over a few-meter distance. TSIM produces signal levels varying by six orders-of-magnitude so that TBAD's reaction to near and distant aircraft may be judged. 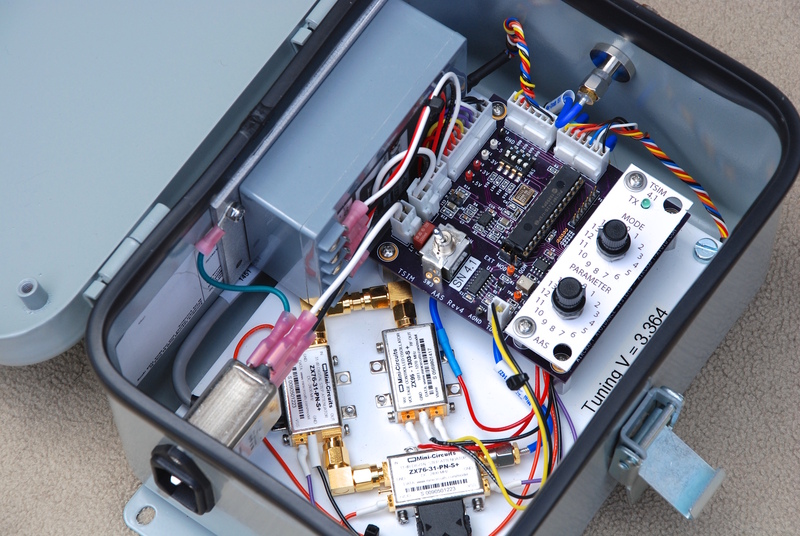 A transmitting patch antenna can be affixed near the TBAD antenna such that periodic validation of TBAD sensitivity and response can be compared to baseline performance. Most of the transponder traffic at present is in the form of Mode A (temporarily-assigned ID among 4096 choices) or Mode C (encoded altitude). This is a primitive adaptation to the World War II era Friend or Foe identification scheme (see synopsis of transponder codes page). Here we have an example capture of such a code by TBAD, after roughly 35 dB of amplification. The blue curve is the directional (array) signal, and the green curve is the single-patch ("omni") signal. Pulses are 0.45 μs in duration on a 1.45 μs cadence, their presence or absence indicating whether a bit is present. Valid signals always "light up" the first and final framing pulses (F1 and F2), and never the "X" position in the middle. Otherwise this signal reads 4530 (A, B, C, D digits). This could be the Air Traffic Control (ATC) assigned temporary ID (dialed in manually by the pilot on the transponder), or it also happens to map to altitude of 3400 ft. About a third of the codes map to altitudes, and nothing in the signal indicates which type is which—unless there is no corresponding altitude mapping in which case it must be the "squawk" ID code. The magenta curve is the ratio between the signals (or just difference in dB space). When this pops above some threshold (like 5.5 dB as shown here by the red dashed line), simultaneously satisfying a power threshold on the directional signal (to eliminate triggers from noise and too-distant planes at low elevation angles), an aircraft is deemed to be "in-beam". In this case, the airplane is clearly in the central beam and constitutes a closure condition. 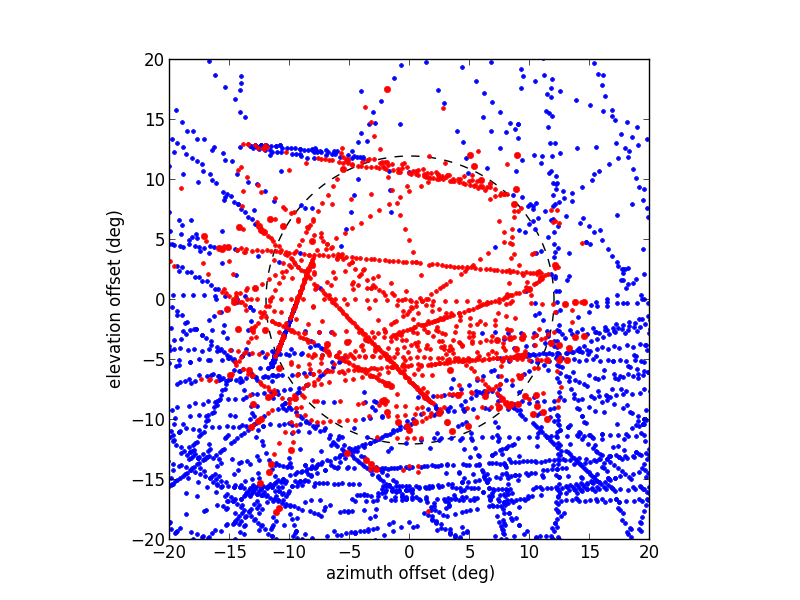 This is a sample of what TBAD data looks like, showing a variety of features. The green text represents serial characters sent by TBAD (at 115,200 baud); everything else is added by the Python code that reads the TBAD stream and packages it into a log file with added interpretive information. Four basic types of transmissions are represented here. Mode A and Mode C codes look similar: short four-digit codes—here either 6667 or 1524. Only the latter maps to an altitude (and a reasonable one), so it is identified as Mode C while the 6667 code must be the Mode A ID code. A Mode S transmission is seen in the fifth row (56 bits represented as 14 hexadecimal characters). In this case, we learn that the permanent aircraft ID is A4063D (in red), which happens to be a Boeing-767 operated by American Airlines (tail number N359AA). This particular Mode S transmission also conveys altitude information (in agreement with the Mode C result: 34,000 ft). Other information/formats are possible under Mode S.
The richest information is contained in the two long codes, which correspond to ADS-B transmissions: 112 bits represented as 28 hex characters. The two examples here also carry (shown in red) the permanent airframe ID, but one of them carries 3-D GPS coordinates of the airplane, while the other communicates speed and heading information. The other thing to pay attention to is the blue B symbols, indicating that TBAD thinks the transmissions originated from within the protected beam zone. Note that this sequence shows a transition from out of the beam (no B symbols: just a dot in its place) to consistently in the beam. In this instance, TBAD was configured to close the shutter if more than 8 B events happen within ten seconds. The leading 's' character in the TBAD transmission indicates that the shutter closed (was 'o' for open before) on the eighth B event—less than a second after the first B event was registered. Telescope telemetry information is added in this example, so that we can track where the TBAD antenna is pointed in the sky. See also the TBAD data interpretation document (PDF) for more details on interpreting TBAD information. By collecting latitude and longitude information from ADS-B transmissions and combining this information with telescope pointing information, it is possible to make a view of the sky as seen by TBAD. This image shows a compilation of many flight tracks crossing in front of the Apache Point installation. Red dots represent ADS-B lat/lon transmissions that TBAD deemed to be in the protected zone/beam. Blue dots were noted (recorded) by TBAD, but not judged to constitute a closure condition. The striking pattern here is that central points are red. A circle of radius 12° acts as a guide: except for fuzziness near the edge, transmissions within 10° of boresight were tagged as being "in the beam." Note that accompanying the ADS-B transmissions (shown here) are loads of Mode A, C, and S transmissions (not shown here), providing TBAD with even more opportunities to trigger. Also worth noting is that TBAD will keep the shutter closed for as long as there are a certain number of "in-beam" events within the last ten seconds, and not release the shutter for another ten seconds after this condition clears. So even if there are intermittent blue dots in the middle, they do not constitute a safety issue: TBAD is convinced by all the preceding events that the shutter should stay closed.